I’ve gotta say, this year’s Halloween was pretty great. Kids loved being a part of making their own costumes. 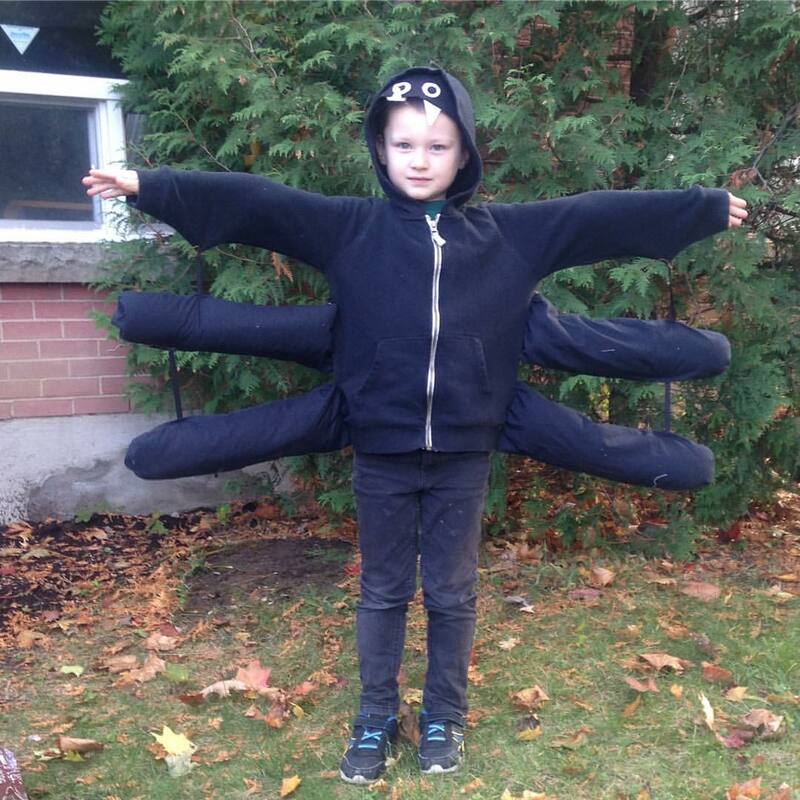 Lucas wasn’t as involved in the making as much as last year, but he still loved the way his costume worked. He chased his sister and his friends around the yard hissing (as spiders do apparently). Sadie loved designing the wings of her costume. 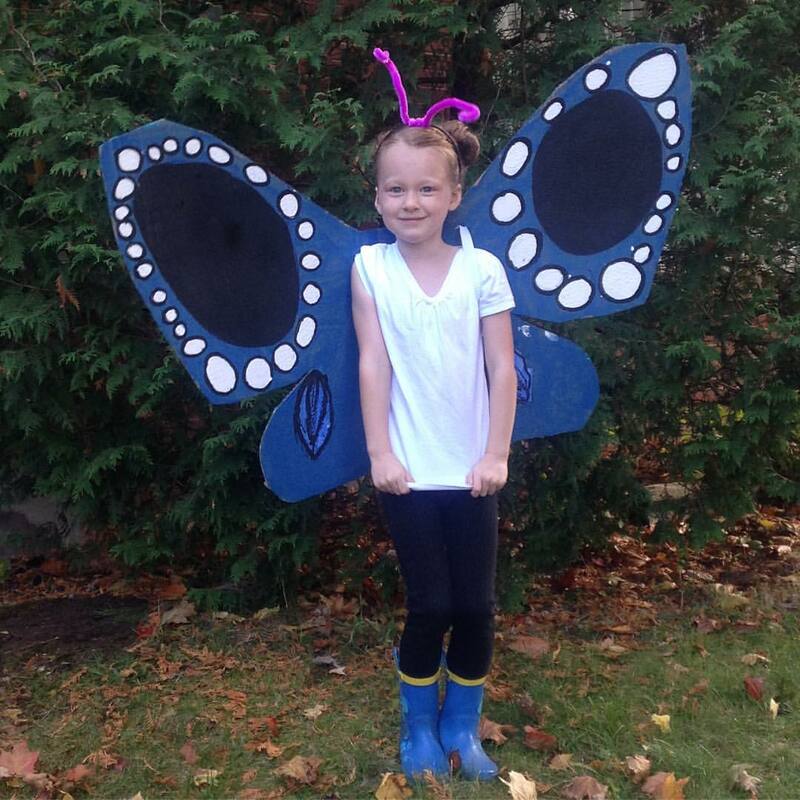 She wanted super big wings, and was all about them being blue and spotted. I suggested monarch wings, but she would have none of that. The best part was the glitter spray paint we bought for them the day before halloween. She gasped when she saw them fully finished. Then she wore them all afternoon on halloween until dinnertime. That evening we headed out when we saw our neighbour kids hanging outside. They told us that because our neighbourhood wasn’t as into halloween (older couples) and that they drove to a relatives neighbourhood to do trick or treating. They invited us and it was really fun. There were 8 kids plus some all racing to houses, while we chatted. Near the end, Lucas bailed hard and rolled his ankle. We said good night to our friends and headed home to do candy inspection. The great thing about halloween with our kids is that when I tell them that we would divide the candy 3 ways, they didn’t bat an eye. They were super happy to share and to have things fairly equal. Also, I’ve never been to a neighbourhood where they give away full chocolate bars, but each of our kids got 2 of them. Whoa. Today I’m busy setting up the etsy shop again and getting a sugar high while I work. Tootsie pops are my jam. Kids looked fabulous…and it sounds like they had a blast……One thing I missed about Halloween in the old place was being able to dress up the house and myself and scaring the pants off the kids!!!! Loved it!! !